Canalice a su arqueólogo interior mientras explora los exuberantes paisajes tropicales y la historia antigua de Belice por tierra y por agua. Busque animales silvestres como monos aulladores y cocodrilos en un crucero por el río Wallace, un canal comercial histórico. 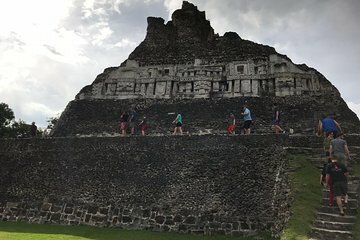 Después de esta aventura acuática, viaje al interior del sitio arqueológico de Altun Ha para realizar una visita guiada a esta antigua ciudad maya, donde puede escalar pirámides de piedra para admirar la selva tropical circundante. Explora las ruinas de plazas, palacios y templos de piedra. Upon arriving in Belize City, we were led by a man to a waiting area on the street and sat for 1 1/2 hours as we watched others being fitted for snorkeling fins ? we weren't snorkeling and weren't given any information by the people working there. We had to ask what was going on and even then didn't get an answer. Three women were writing down booking numbers and asking each other questions, so it was clear they weren't very organized. Loud buses passed by and it became very hot. Eventually we were told that not enough people had signed up for the river tour, and they tried to talk us into doing another excursion. We declined and left. This is really a shame, since Belize City is a poor and dingy place, and they really need the businesses to be a success. I hope they get their act together.